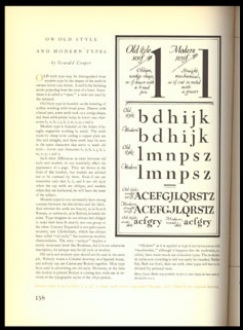 This book is subtitled: “an appreciation of Oswald Bruce Cooper, with characteristic examples of his art in lettering, type designing & such of his writings as reveal the Cooperian typographic gospel.” Oswald Cooper was an internationally known designer of commercial display and advertising typefaces. Born in Ohio, he moved with his family to Coffeyville, Kansas, where he became an apprentice in a printing shop, a “printer’s devil,” at the age of 16. 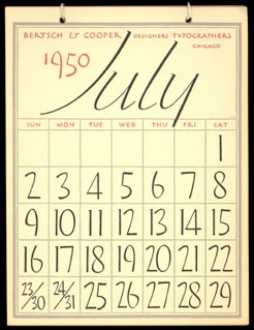 At the age of 21, he moved to Chicago as a student of Frederic W. Goudy, recognized as one America’s greatest type designers. He later was a partner in his own design firm, Bertsch & Cooper, Inc., Typographers. 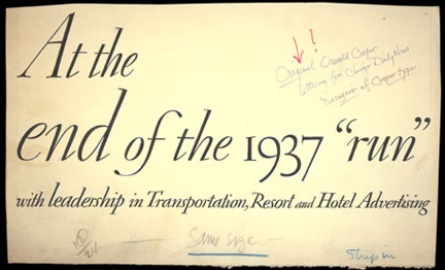 The Skaggs Collection also boasts this original artwork, identified by Skaggs as “Original Oswald Cooper lettering from Chicago Daily News. Designer of Cooper types."